The pressure of our campaign is mounting! Wednesday’s UPTE Research and Technical strike drew the largest press coverage of any UC strike yet. 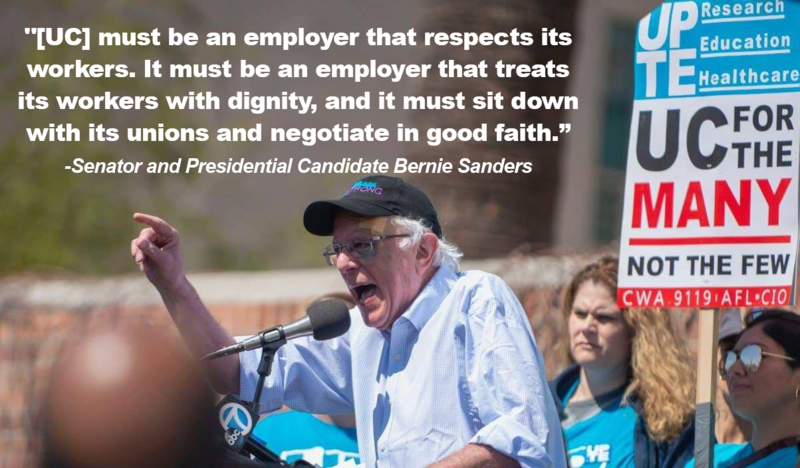 Never before have UC workers been joined on the picket lines by such a prominent figure as US Senator and leading Presidential Candidate Bernie Sanders, who called out UC executives in blunt terms for their labor practices. Thousands of UPTE members braved morning rain to show our determination, with AFSCME 3299 and student allies turning out in solidarity. Our strike received national coverage in the New York Times, Washington Post, U.S. News And World Report, The San Francisco Chronicle, The Sacramento Bee, NPR, and other outlets. Watch a video of Senator Sanders speech here! The success of our strike signals that if we continue to organize, we will win! Click here to sign a strike pledge to show your commitment to taking further action if we need to protest UC executives’ illegal bargaining tactics or in solidarity with other UC workers! We will keep fighting for a fair contract, and won’t stop until we’ve won!